Written by Alex Towns. Uploaded 22 January 2007. Having been told at the tourist information back at Kununurra that the Bungle Bungle�s (aka Purnululu National Park) was indeed open, after a couple of the locals en-route gave us the shrug of surprise we set off along the 50km of dirt track, twisting and corrugated, hoping that we wouldn�t find a ruddy great gate locked at the other end barring our way. Fortunately at the rangers station, although no one was about it seemed as though at least one of the campsites was open so long as you didn�t start any cooking fires. To say they are paranoid about fires is an understatement and quite rightly too as it�s been the driest period for ages across the whole of Australia. It does make bush tucker somewhat challenging and BBQ never quite taste the same with gas. There were a number of fires on the far hills as we drove in which were scheduled burns to help prevent major disasters, so long as they avoid the last two controls� �In control� � �losing control� � �out of control� � which alas happens from time to time. We�d invested in an annual Western Australia parks permit, which permitted entry into most of the national parks in WA without being charged on entry. With plenty of parks to explore this seemed a great way of jumping the queue. Camping in the parks is simple but effective, normally with a pit toilet and occasionally water. They charge per head, but it is done on an honour system where you fill out a little slip attached to an envelope, tear off the slip as receipt, then pop your dosh into the envelope and stick it in a secure letter box. All quite straight forward, but I couldn�t imagine it working in many of the other countries we�d passed through, except perhaps China. We�d decided to be good whilst in the park and stay in the appropriate camping spot. Driving around the Bungle Bungle�s we were a little disappointed to find the campsite hidden in the trees literally miles away with no real view at all. Being the only ones daft enough to come in the heat of the summer, we had the pick of the place, although discussing which trees would give the best shade come the morning, dragged out the selection process! With evening fast approaching we decided a view was in order to compliment our glass of chardonnay. Back out onto the track we found a suitable spot to charge our glasses and climbed onto the roof of Tinfish to admire the views. Now this is where being the only mad pome�s in the park really worked as we had the entire uninterrupted view to ourselves without the sound of any other tourists, just the gentle breeze and the wildlife stirring for the night shift. Once back in camp we cooked up some tucker then attached our shower hose to the convenient tap and had a comical shower stood on the picnic table to get away from the sand and the ants under the glow of our head torches. Since being on the road we�ve never been so clean. Australia is such an easy country to travel in as you know that you can find key resources such as fuel and water just by looking at the map and subsequently our water tank is always full and able to give us a cooling refreshing shower to wash the dirt and grime away, which is a real life saver. Early to bed as we had a full day of exercise planed for the morn. Being sensible we�d decided to do the Mini Palms walk early in the morning as it doesn�t benefit from shade like the others. Unfortunately with the sun coming up early in these parts and we were just on the cusp of daylight savings, it meant the alarm was set for 4.30am..!! Psychologically though we were still on NT time (an hour and a half ahead) so in reality for us it was more like 6am� still too damn early though. It was pleasant watching the sun rise and the rocks change colour as we drove the 30km from camp to the walk. It was well worth it as you start your walk amongst the needle sharp spinifex grasses which spike you each time you brush against them, before you start to scramble your way through a narrow gorge and follow the path to the viewing platform deep inside the rocks, which allows you to peer down into the huge auditorium. Perched up on the side of the rock faces are the palms, safely out of the way of the waters that must flood these gorges and cascade through the twists and turns during the wet. 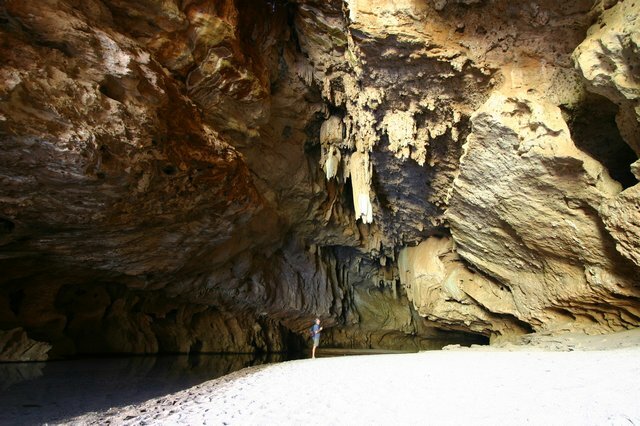 Just a little way along is the second attraction, Echidna Chasm. Again this is a bit of a scramble through the rocks and boulders but you are rewarded with the amazing sensation of squeezing along the knife sliced slit which beckons you deeper into the gorge like Alice in Wonderland down the ever decreasing corridor. You need to crane your neck to stare up at the multicoloured rock face rising vertically on either side of you no more than an arm�s width apart and closing as you move further back into the throat of the chasm. I find erosion like this incredible, how the water finds and exploits a simple fissure in the rock to erode over thousands of years this incredible cut. We sat and chilled out in the shade created by the sheer walls entirely uninterrupted whilst we nibbled on our nuts n sultana energy food and slurped down water to keep hydrated. They say you need to drink 6L a day in these climates� that�s FOUR of your normal Evian bottles of water..! After a light lunch we back tracked the 30km past the camp then onwards another 16kms (this isn�t a park you can easily walk around!) to the final attraction, Cathedral Gorge. 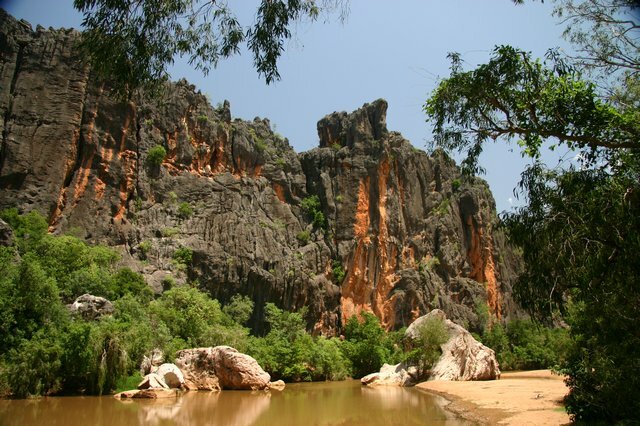 This part of the park is set amongst the more ubiquitous rock formations that the Bungle Bungle�s are renowned for. Lumpy beehive shaped hills coloured in layers to give them that defining striped appearance. These rocks are made from sandstone and conglomerates and their stripes reflect the amount of water they accept � the rock within the dark stripes is more permeable, allowing algae to flourish, while the less-permeable lighter rocks are created by iron and manganese stains. Basically they look incredible! Following the track around these formations is a photogenic opportunity not to be missed, set contrasting against the bright blue skies. The trail then takes you into another gorge which again bears testimony to the power of water erosion when you emerge at the dead end in a colossal expanse scoured out of the rock as if they�d made an ancient wall of death for a motorbike to race around. Standing by the plunge pool (no salties here) you can look up to see where the water cascades down when in full flood. It must whip the sand and rocks into an immense frenzied whirlpool gouging out more of the circular pit before continuing down through the gorge. We lay for awhile in the shade enjoying the peace and tranquillity, reading a book and dozing a bit after our early start. Our newly bought fly nets, although making you look a twit worked remarkably well in preventing further intimate experiences with the flies exploring all orifices of your face. During the day we�d clocked up an impressive 10km of walking, not at all bad for us who now after 73,724kms of driving have over developed right calf muscles as alternating between accelerator and brake peddle is the most exercise we normally get! As showering is so easy here, we popped back to the campsite to strip off and clean up once more before heading back along the wiggly dirt track to the main highway. We inflated our tyres back to road pressure just as a police car pulled up to check and make sure we were okay. It�s nice to know they care. Back on tarmac we cruised north towards Parry�s Creek Farm. Becoming more familiar with chance meetings, whilst we were filling up on the way down to the Bungle Bungle�s the chap at the pump next to us started chatting about our trip and was really interested since he used to run an overlander truck down Jordan, Syria and Egypt. He kindly offered us a room at his new venture Parry�s Creek Farm so that we could swap further travelling yarns over a beer. 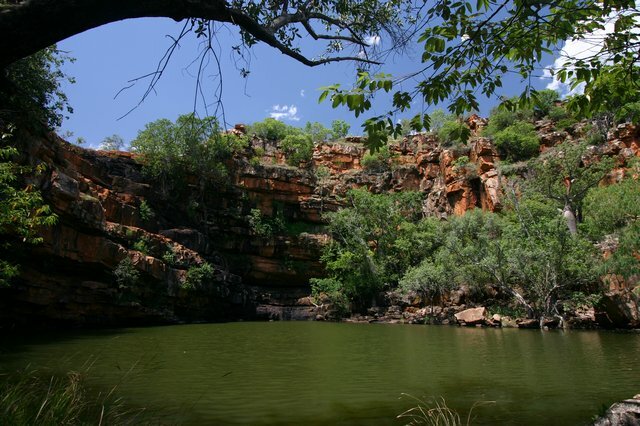 Parry�s Creek Farm is a great place just at the Kununurra end of the Gibb River Road with some comfortable accommodation on the banks of the billabong alive with birds and ample camping space. What caught our eye was the cool swimming pool crying out for a refreshing dip. We immediately got down to the serious business of drinking beer and swapping travelling stories of which Justin had more than enough to compete with ours. One beer turned to three and before long Kristie came down from the house to see what was keeping Justin. Maz had an eventful trip to the loo when she was confronted by a small python curled around the bowl waiting patiently for the frogs that love to frolic in the water! We had a great evening but after our strenuous day our heads were beginning to droop so before much longer it was time for bed. A lie in was the order of the day and it was some time before we popped our heads out into daylight. Justin had gone off fishing for the day with promises of a slap up fish feed on his return. 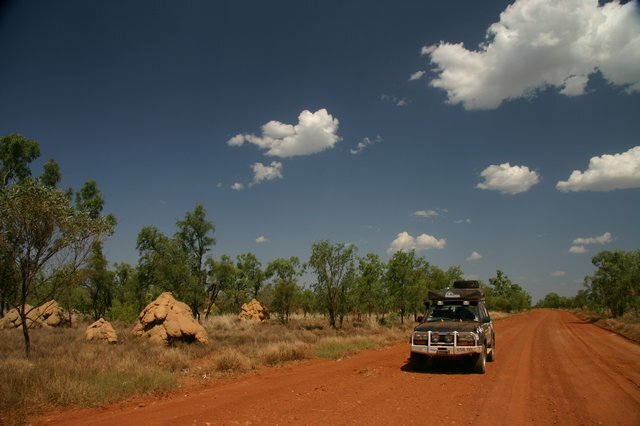 We busied ourselves with admin and decide to just pop back into Kununurra to fill up Tinfish with fuel and us with provisions for our next bit of adventure into the Kimberley�s along the Gibb River Road. After the hour drive to town we were a bit taken back to find at first glance what looked like a ghost town. Okay it was a Saturday, but it was early afternoon so we expected at least the major supermarket to be open! Foolishly we only tried the front door which was closed however just by chance we happened to drive round the back where the door was open � go figure? Nothing is ever quick, so it was dusk by the time we returned to Parry�s Creek Farm. The guys fishing had had a reasonable day, no Barramundi, but fresh Salmon (not the typical pink fleshed fish, but a different type of Salmon) so the slap up fish supper was in full preparation. The food was delicious and washed down with a few beers and a few more stories we had another great evening. Before we got too comfortable and worried Justin and Kristie that they�d taken in squatters we needed to push on ahead of the pending wet and tackle the Gibb River Road. Loading Tinfish up the next morning took as long as normal and we decided a last swim in the pool was in order before we popped over to say goodbye. As it was already gone lunchtime, they indeed thought they might be entertaining guests for a third night! Thanks guys for all your hospitality, it was really great to relax and stop still for a moment and we wish you every success for Parry�s Creek Farm, I�m sure it�ll be a huge hit. So turning right off the tarmac we were finally on the Gibb River Road that we�d read so much about, the main artery running through the Kimberley�s. Tyres down to correct pressure we set off in a buoyant mood. With stomachs rumbling we soon picked out the shade of a suitable Boab tree under which to rustle up some sandwiches. These trees are great, they look like an upside down tree which some giant has plucked from the earth turned over and stuck back into the ground leaving the roots sticking upwards into the sky. Whilst Maz prepared tucker I crawled under the car to check our breather pipes on the gearbox and diffs were firmly attached to ensure that during any expected water crossings we didn�t get water sucked into places it shouldn�t be. The views were beautiful, but up this end of the Kimberley�s the few gorges to see had already been closed up in preparation for the wet, which was a wee bit disappointing as so far we thought the condition of this infamous dirt road was far superior than many of the tarmac �highways� we�d travelled on in other parts of the world! Nevertheless we were fast approaching our first main water crossing which always looks good for the photos. Again we were a little disappointed to find a few drying water puddles rather than a technical river crossing. So far it�d been too easy. With evening drawing in it was time to find camp. With all the official sites closed for the wet we couldn�t have stayed at the correct place even if we�d wanted to. We arrived at another dry river crossing where Justin had suggested would make a good camp if you followed the track across the sand. Although it was very picturesque the rumble of thunder and grey clouds approaching worried Maz into visions of �flash floods�, something not to be taken lightly especially as we�d experienced one and witnessed it�s destructive force during our travels in Africa. I took to feet to do a recce, instead of risking getting Tinfish bogged down in the sand and on my way back to report noticed the rear tyre looking a bit erm flat � arse a puncture and at the speed it was falling must have literally just happened. We got Tinfish back on the road before going through the now well rehearsed procedure of changing a wheel. Unfortunately as the car was going up, even with the chock in place it rolled back ever so slightly, but enough to put the bottle jack at an angle. Knowing the weight we were dealing with, taking the wheel off with a crooked jack wasn�t an option, so I diligently lowered it to be repositioned. Unfortunately with the tyre now totally flat, even with the jack fully lowered it was still taking the weight of the axle as the wheel hadn�t reached the ground and so the jack was wedged stuck! Not to worry, we have our onboard compressor, so I�ll be able to re-inflate the tyre enough to take the weight, free the jack and start over again. With the compressor living under the bonnet a quick pull on the bonnet release was all that was needed to gain access. As I pulled I heard a peculiar noise and the cable went limp! Hmm that�s odd. Trying again it was obvious that something had broken and the bonnet weren�t budging. Double arse. I still had tricks up my sleeve though to sort out the wheel, the hi-lift jack we�d carted around the world but never used� for emergencies only, now perhaps was the time to christen it! It was about now that Maz distracted my attention away from the wheel when she remarked �If we can�t open the bonnet how are we going to pump the fuel filter and start the engine tomorrow morning?� Ever since Toyota Laos had done a fuel filter change we�d been experiencing an intermittent problem where the diesel drains from the injectors. Being diesel the only way to start the engine is to then re-prime the fuel filter by pumping the little black button on top. To get to said black button you need to open the bonnet. Our predicament now was that since being in Australia this intermittent problem had upgraded itself to a morning ritual, otherwise Tinfish wasn�t going anywhere. Of course it had been on the list given to Toyota in Darwin, but they�d not been able to replicate the fault. Suddenly the flat tyre was the least of our problems and I attacked the bonnet release with just about every tool in my elaborate tool box. Take it from me they aren�t designed to be opened from the outside. Fortunately we were the only tourists in the Kimberley�s as my profanity echoed from gorge to gorge, frightening flights of cockatoos and set of bouncing herds of kangaroos. In one last act of desperation I gave the bonnet a resounding whack (imagine the scene in Faulty Towers when Mr Faulty has to race into town to pick up a take-away duck for his new gourmet restaurant after his chef gets drunk because Manwell doesn�t love him and in the heat of it all his mini breaks down, so to teach his car a lesson he goes at it with the branch of a tree) There was a click and we froze. Holding our breath we tried the bonnet release again and it opened as smoothly as it had done a million times before! With the wheel changed we quickly found the obvious great big hole where the stone had punctured it and hoped it would be repairable when we got to the next roadhouse. To be safe we just bungeed down the bonnet in case it decided to play silly buggers again, but for now we settled down for a much needed glass of wine on the cliffs overlooking the river below. With the occasional streak of lightening dancing above the plains which stretched out for miles before us from the foot of our camp it wasn�t a bad spot to unwind. It�s great to bush camp and not be found by interested locals. 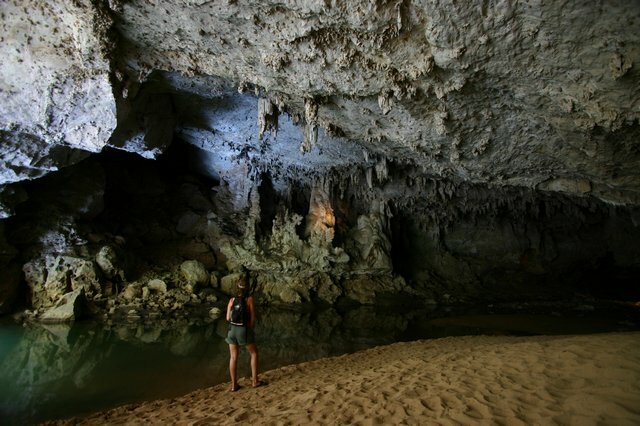 Although we�ve sincerely enjoyed meeting all the locals whenever we stop, it�s sometimes nice to just have our own space and not get disturbed. Living as we do outside the car we can�t escape into a room and close the door, so we are always on display and entertaining the locals. You might find it unbelievable to learn that in all the many nights we�ve bush camped on this entire adventure there are far less than a few dozen nights where we�ve not been disturbed either as soon as we set the tent up and start cooking or else in the morning when we strip off to shower! It�s remarkable how they find you when we think we�ve found the perfect isolated spot miles from anywhere, up pops a little face. Somehow with no one to disturb us here it almost felt like something was missing�!! After a leisurely morning we made our way to Mt Barnett Roadhouse to see to the tyre, but by the time we arrived they were away on an extended lunch break, in fact during the wet they�re closed more often than not. 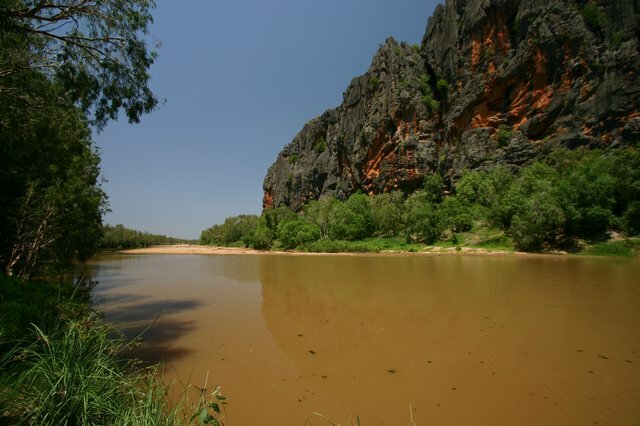 No matter, Manning Gorge was nearby and more importantly open, so we headed up there to stretch our legs. The walk starts by a beautiful pool surrounded by shady trees with each branch supporting a noisy cockatoo. You then followed an assortment of old beer cans and reflective road markers on towards the gorge. It�s actually quite a long walk and a bit up and downy as you cross the bush, once again we were thankful of our fly nests to keep the blighters out. At the end of the track is a delightful gorge, no water flowing over the falls as yet, however a cool refreshing plunge pool which we nervously stripped off and dunked ourselves in, still conditioned to be on the lookout for salties and not sure what flavour croc lived in this gorge. Although there is a campsite at the start of the trail, after making use of the water buck for another shower, we decided to push on a bit and see what we could find. On passing the roadhouse again it was still closed, so the tyre would have to wait another day. 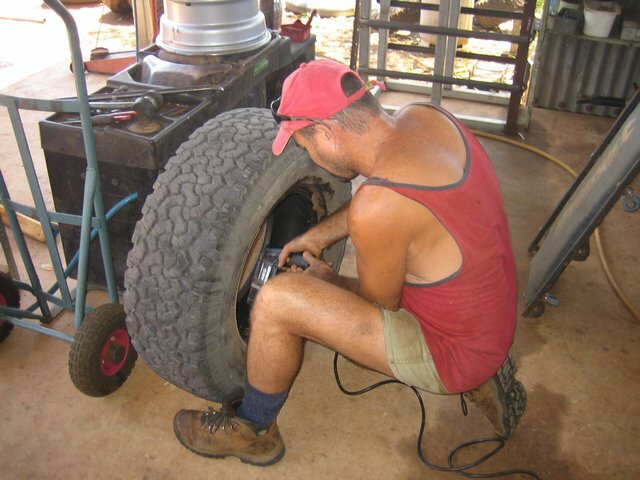 We did for our Aussie leg of the journey invest in a 2nd spare making use of one of our old steel wheels when we bought the new ones and also managed to find a used tyre to go on it in alright condition. So with that strapped to the roof like a conning tower we felt safe enough risking another day until we arrived at the second roadhouse on the Gibb River Road. We found another isolated spot down a dirt track to make camp and had a slap up BBQ chicken feed. With no reason to rush we were getting used to these lazy mornings and the sun wasn’t as intense as we expected. Just to get the legs working again had a little walk to Galvin’s Gorge, not on the same scale as Manning but pretty enough in it’s own way. We then made a beeline for Iminitji to get the tyre repair. At first glance it looked closed, however to one side was a garage and the chap was there tottering about. With the tyre off in no time he was confident it could be successfully patched, so we sat and waited in the shade being eaten alive by these huge marsh flies… a bit like horse flies on steroids! I was racking up quite a tally when he announced the tyre was fixed, but it’d be best not to use it for at least 12 hours to let the glue set fully… of course if we got another puncture and needed it, it should be fine. On their recommendation we back tracked a little bit to visit Adcock Gorge down a short 4x4 track and surprisingly there were already other tourists there. Most of these gorges have a full plunge pool at the base of the waterfall (or water dry as we were finding) then steep rock walls to the top where the water flows over and slowly eats away at the rock and thus extending the gorge. 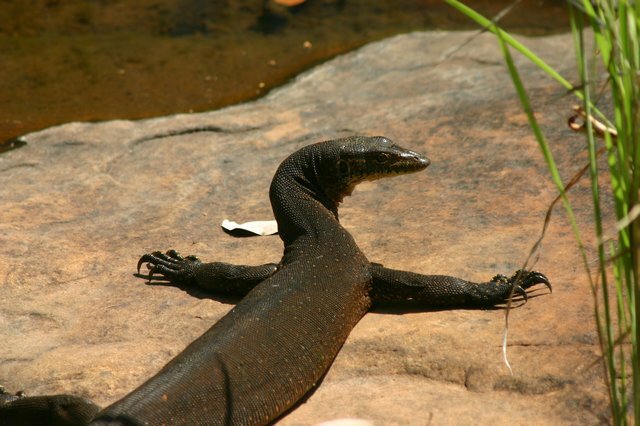 The water attracts a myriad of life and on the way back from this walk we found a friendly monitor lizard lounge in the sun, before he plopped into the water and went for a swim. He didn’t see particularly concerned about us being there. Carrying further along the road west we passed the turning for Bell Gorge, suppose to be one of the highlights. Although there were road closed signs across the road, there was ample space to sneak round and feeling confident that we’d managed to slip through our spirits were subsequently deflated 10km down the road where we found a locked gate – curses. Further down the road was another closed gorge, but again we could easily get round. This time our path wasn’t further barred and after a scramble of a walk over loose rock we got to the edge of Leopold Gorge. This narrow, deep gorge flowed slowly beneath us as we sat perched on the edge admiring the views and enjoying the tranquillity. 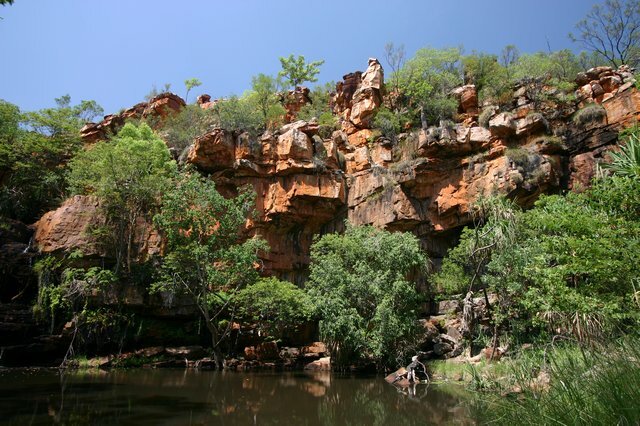 With one more planned day in the Kimberley’s we sketched out a plan to take in the remaining major sights. It made sense to put in some time on the road and get to the furthest, Tunnel Creek, which was some 60kms up a side road to the main Gibb River Road. We arrived at dusk and pulled up in the car park by the no camping sign and set up the tent whilst talking to some guys from the local mine who were just leaving. As they left I noticed to my horror that another tyre had been punctured and was quickly deflating. Again given the speed it was going down we must have literally just done it as we turned into the car park – bugger. This time the wheel change went like a well oiled F1 team, however the small rock protruding from the tread didn’t look too promising! 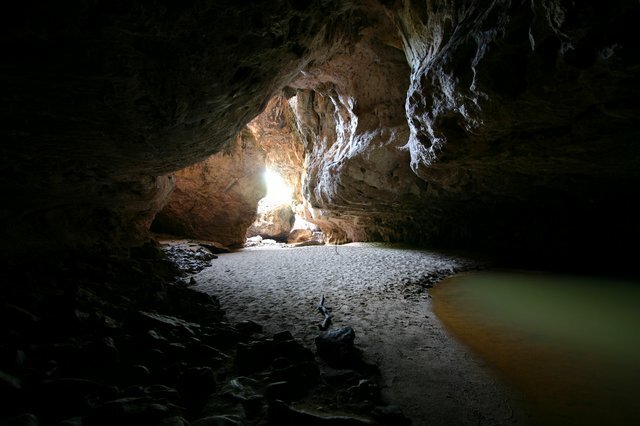 Tunnel Creek is a 750m long passage, 3m to 15m wide in an inverted ‘T’ shape, created by the creek cutting through a spur of the Napier Range. 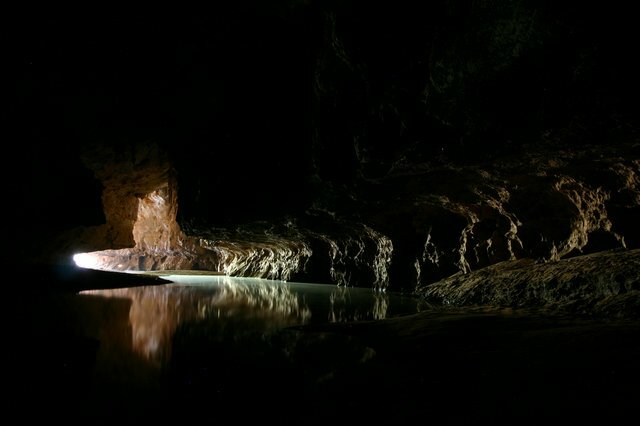 We’d been told that its well worth exploring at night, so tentatively we set out, torches in hand. Most of the way you can stay on the dry bank of the creek, but you need to wade through in a number of places as you keep an eye out for the freshwater crocs that have been known to call this home! About halfway along the ceiling has collapsed which gives access for the colony of bats that hang screeching from the ceiling. With our rather dim LED torches it made for quite an interesting night stroll. Once you emerge from the other end, the way back is through the tunnel once more! In the morning we decided to do the same walk in day light which was subtly different as the collapsed ceiling midway down let in a faint light. At the far end of the tunnel are a few pieces of Aboriginal art and we found another lizard lazing in the sun. Back towards the Gibb River Road we stopped off at Windjanage Gorge, the walls of which soar 100m from the Lennard River. The rocks that this gorge cuts through are part of the Devonian Reef National Park and were once part of the western coral ‘Great Barrier Reef’ some 350 million years ago! Looking closely at the rock (and with a bit of imagination) you can see ancient fossils of marine critters. It’s also suppose to be the prime place for spotting freshies, but try as we might during our walk along the river we didn’t spot any crocs. 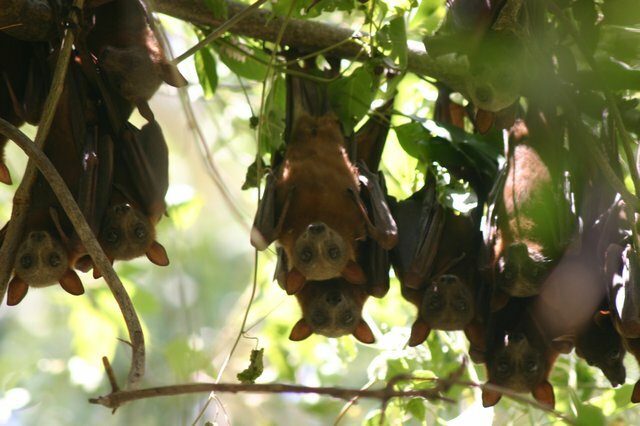 As appears normal for us we set out walking right in the midday sun so tried to stay under the cover of the trees until we reached one point where the trees were literally crawling with flying foxes. They weren’t too happy to see us and erupted in more and louder screeches than they normally do. A couple gave flight and one flew straight into me! We didn’t make it to the end of the gorge as the sun was by now blistering and the trees thinning out, so we decided to head back to the car to make a sandwich before we pushed onwards on the final stretch towards tarmac. After watching a couple of road train tankers roar up the road dirt road without a care we finally joined the tarmac and waved goodbye to the Gibb River Road… only two punctures, oh and the ABS shook itself to pieces too! Shame you couldn't get to Bell Gorge - you have an excuse to go back some other time though!